A shareholding change at printing company BHS Industries Bhd was among the more notable ones seen in filings with Bursa Malaysia between Sept 08 and 12. The Federal Land Development Authority (FELDA) surfaced as a substantial shareholder in the company, after acquiring eight million shares or 11.1% equity interest. While FELDA’s purchase price was not disclosed, BHS ended trading on Sept 05 (the day of the acquisition) at RM2.86. FELDA is the second government-linked fund to buy into BHS. In early August, Pelaburan MARA Bhd acquired six million shares or an 8.3% stake in the company. BHS’ stock price hit a 52-week high of RM2.97 on July 17, but it had eased to RM2.87 by Sept 17 (Wednesday). At IFCA MSC Bhd, fund manager Brahmal Vasudevan ceased to be a substantial shareholder after selling 11.2 million shares on Sept 02. Brahmal had emerged as a substantial shareholder in the business solutions company in late August, with a 5.5% stake or 25 million shares. It is not clear if Brahmal has sold more shares in IFCA, but the stock surged more than 330% over three months to peak at 52 sen on Sept 02, the same day the fund manager parted with some of his shares. Since then, IFCA’s shares have tapered off, closing at 41.5 sen on Sept 17. At Scanwolf Corp Bhd, Datuk Lai Kok Heng ceased to be a substantial shareholder after selling 2.3 million shares in the furniture marketing and manufacturing company. Lai had become a substantial shareholder in mid-June, after buying a tranche of 1.3 million shares at 35 sen each in an off-market deal. He now holds up to 3.8 million shares or just above a 5% stake in the company. Scanwolf hit a multiyear high of 61.5 sen on Sept 09, gaining more than 27% since early June. The counter ended at 58 sen on Sept 17. Other than Lai, Datuk Tan Sin Keat ceased to be a substantial shareholder in Scanwolf in early August, after he sold four million shares at 50 sen apiece. Tan is one of the founders of Scanwolf, and has been an executive director of the company since April 2007. It is worth noting that private company Better Project Management Sdn Bhd, the vehicle of Chan Nyen Wee and Chin Yoke Lin, surfaced as a 26.5% shareholder in Scanwolf, controlling 20 million shares in early August. Café operator OldTown Bhd’s shares have slipped almost 14.5% since early August, and closed at RM1.90 on Sept 17. During the week in review, Artisan International Small Cap Fund sold close to 1.8 million shares in the company, trimming its stake to 22.3 million shares or just above 5%. Filings with Bursa indicate that the fund, which is based in Milwaukee, the US, ceased to be a substantial shareholder during the week ending Sept 19 (Friday). Other than Artisan, another US fund — Franklin Resources Inc — has also been paring its shareholding in OldTown. Franklin now owns 6.4% or 28.8 million shares in the company. In-flight catering company Brahim’s Holdings Bhd’s stock price hit a 52-week low of RM1.16 on Sept 04. It has been trending downwards since reaching a high of RM2.71 in early March, largely due to the two mishaps suffered by Malaysian Airline System Bhd. Brahim’s closed at RM1.34 on Sept 17. Nevertheless, Koperasi Permodalan FELDA Malaysia Bhd (KPF) has been nibbling at Brahim’s shares during this spate of weakness. During the week in review, KPF acquired 1.7 million shares, nudging its shareholding up to 14.3 million shares or just above 6%. 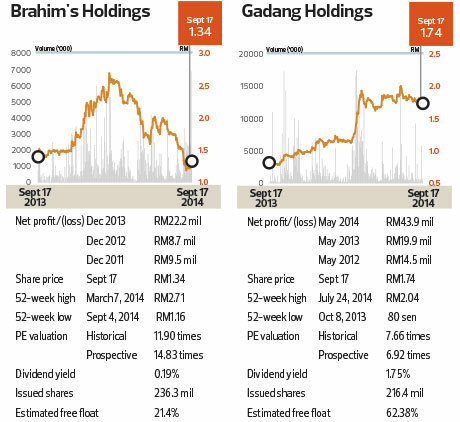 Gadang Holdings Bhd’s stock is coming off a multiyear high of RM2.01, which it hit at end-July. On Sept 17, the stock closed at RM1.75. Kumpulan Wang Persaraan (Diperbadankan) or KWAP has been actively trading in Gadang’s stock. It had surfaced as a substantial shareholder in the construction company in end-August, after mopping up 11.3 million shares or 5.2% equity interest. However, on Sept 03, KWAP sold 2.4 million shares and ceased to be a substantial shareholder in the company.